Photomicrograph of Bacillus anthracis (fuchsin-methylene blue spore stain). 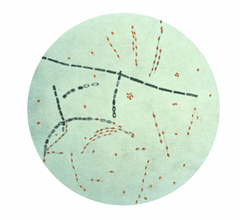 Bacillus anthracis is a gram-positive rod-shaped bacterium, 1–1.2µm in width and 3–5µm in length. It is the agent which causes anthrax. The bacillus lives in soils worldwide at moderate temperatures. It can be grown in aerobic or anaerobic conditions (it is a facultative anaerobe) in a medium with essential nutrients, including carbon and nitrogen sources. In 1877, this organism was the first to be shown to cause disease by Robert Koch and verified by Louis Pasteur. B. anthracis belongs to the B. cereus group of strains. Bacillus anthracis Facts for Kids. Kiddle Encyclopedia.